The Q+ is 4K ready and will carry a price tag of $2,999.99 to $5,999.99. Resolution fanatics hoping that 4K TVs will become cheaper got some welcome news from Sharp on Monday when it unveiled its Aquos 4K Ultra HD, with 60- and 70-inch versions priced at USD$4,999.99 and $5,999.99, respectively. The struggling Japanese electronics maker announced four series of TVs at the Consumer Electronics Show, including the 2160p-resolution, THX 4K-certified Aquos 4K, that promise eye-popping visuals in a market saturated with pixels and subpixels. A slightly cheaper TV, the Aquos Quattron+ (or Q+) is billed by Sharp as the highest resolution full HD TV in the world that's currently available. 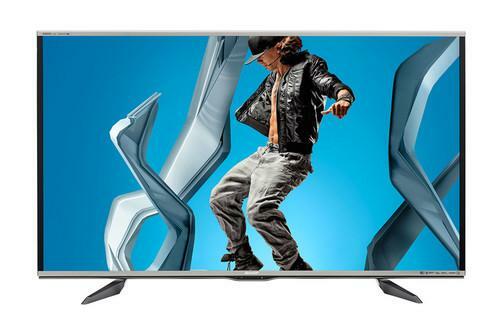 It's priced at about half of the cost of a premium 4K TV and Sharp calls it a game-changer. "The great thing about this technology is it's future-ready," said Christopher Loncto, director of marketing communications at Sharp Electronics Marketing Company of America. "When 4K content becomes more available, this will play it without the need for any additional adaptors or anything like that." The Q+ comes in 60, 70 and 80-inch screen sizes and features Quattron and Revelation technologies, which enhance picture quality, as well as 16 million subpixels and 4K signal playback. The THX-certified screen will carry a manufacturer's suggested retail price of $2,999.99 to $5,999.99 and will ship from February. Sharp also showed off the Aquos Quattron(Q), which features 33 percent more subpixels than standard HD TVs and a 240Hz native panel refresh rate, as well as the entry-level Aquos HD TV.